Color Correct light for home furnishing showrooms and design areas. Quality light helps capture designer's intensions and creativity. true Light, Full Spectrum fluorescent light bulbs with a natural light spectrum and layer penetrating capabilities. Color Correct light for displaying home furnishings, color correct ight for design studios and showrooms, True light reflects designers intensions. Full Spectrum fluorescent light bulbs with a natural light spectrum and layer penetrating capabilities. Several comparisons between LED tubes or LED fixtures have been done. The LED tube is just that, being run with or without a ballast. The LED integrated troffer has the diode strips and circuitry permanently attached to the fixture/troffer or panel light. By comparing two possible options provides the information needed to assist in which way to go. 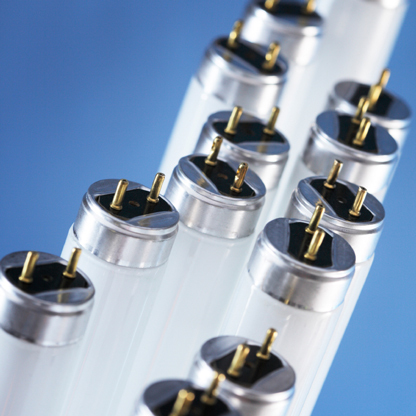 Whether it’s replacing T5, T8, or T12 fluorescent lamps, common observations arise. The energy company incentive offering can also play a role in this. Below are two observations that are based on what your actual needs look like. If you need a contemporary design look then an LED troffer will be the likely candidate. However, if an LED diode strip shorts out, the entire fixture will need to be replaced. The energy company also puts a cap, a limit, on the incentive amount when using LED fixtures. Hence, this cap can extend the ROI up to 50% over a tube replacement. To get the best of both worlds is to use a traditional fluorescent fixture that fits and do a simple conversion on it. Some manufactures are providing fixtures wired for LED tube lights. A diagram of the direct wire option can be found at http://www.crslight.com/90_cri_t8_led_tube_light.htm. If you have fluorescent fixtures already in place, then it may worth considering a fixture conversion. This option eliminates the ballast and involves wiring up the LED tubes direct. This gives you the option to reduce the number of lamps used. Reducing the number of lamps is a viable consideration as the quality of LED’s can add additional foot-candles and brightness. In pre-lamped areas such as storage rooms or low use hallways, reduced lamping can save money— the cost of the lamp and energy usage. This thinking is key if you are after kilowatt savings, a faster ROI, and a way to increase the incentive check issued from the energy company. The energy company’s incentive offering is all about bringing down kilowatt usage. If some of the fixtures are in need of replacement, not to fret. You’ll find that most of these fixtures are repairable. The faded, plastic lenses can be replaced easy enough, even the wrap around lenses are still manufactured. The rare broken receptacle can be easily replaced as well. While on the subject of receptacles, you want to make sure you are working with an unshunted receptacle. You can learn more about this at the above CRS Light link. This strategy is also very green as it saves on trash handling and recycling energy. 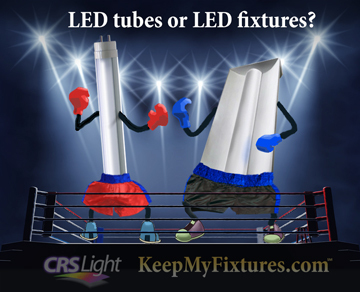 Another benefit of using a replaceable LED tube is that it can allow for taking advantage of future technology. We have seen over the last ten years manufactures leap-frogging one another in the lumens-per-watt ratio arena, lamp life and additional color temperature offerings. So buying into an 8-10 year solution now may permit use of what’s new and better later. We are just now starting to see “yesterday’s” LED’s being replaced by today’s LED’s. In short, once you get past a fixture conversion, you are good to go for the long haul in using LED tube lights. Let CRS Light be your "eye of the tiger" in this process.